Hydraulic systems are part of the fluid power industry. These systems will use hydraulic fluids to create pressure. You can read more details regarding the hydraulic system in the previous article “Hydraulics Basics”. At present, hydraulics is an area for research and the growth is visible for us. Almost every industry utilize some applications of hydraulics. Control accuracy is one of the benefits of the hydraulic system over others. Careless usage and lack of maintenance will create hydraulic problems. Most of the problems in the hydraulic system can be eliminated with proper care and maintenance. The article “Hydraulic System Maintenance” will be a useful guide. There are some common hydraulic problems that can be detected easily. The important symptoms of system failures include abnormal noise, high fluid temperature and slow operation. The ultimate aim of this article is to help you to detect the problems and hydraulic solutions to resolve them. Hydraulic troubleshooting is not an easy task. A person without basic knowledge regarding hydraulic systems and safety precautions can’t able to troubleshoot the hydraulic problems. You can find the solution for all hydraulic system problems through step by step procedures. 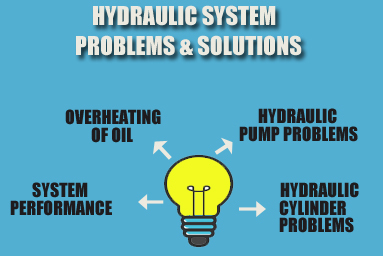 Some common hydraulic trouble causes and hydraulic solutions are listed below. Hydraulic system performance related issues can be categorized into inoperative, slow operation, fast operation and unpredictable operations. The root cause for all these will be different we can discuss some common causes and their solutions. Insufficient/No oil in the system: This is a common reason for an inoperative system. Fill the system with suitable oil as per the specification. Also, check for leakage. Dirty or clogged filter: Filters plays a vital role in removing the contaminants present in the oil. This can be a reason for an inoperative system, slow operation, and unpredictable operation. To resolve this issue you want to drain the oil and replace filter or filter element. Other worn or dirty components will also cause these issues. Excess load: Excess load in the system will stop the operation or slow down the operation. Check the manual for load specification. Aeration/Cavitation: The presence of air bubbles will reduce performance. Repair the system if you found any leak in suction side. Engine Speed: if the engine speed is too high, then it will increase the speed of the hydraulic system. Faster operations will cause system failure. So, always control the engine speed as per the application/hydraulic system. Overheating of oil can be an indication of serious failures. Not only failures, but this is also a safety concern for the industry. Foaming of oil is another problem related to hydraulic fluids. Internal leakage of system Components: Internal leakage of the pump, valve, and actuators will create overheating issues. The solution is repairing or replacing the hydraulic components. Incorrect/Insufficient oil: Incorrect oil selection or insufficient oil in the system will increase the temperature of the oil. Always use the recommended oil according to system specification. Use reservoir having the proper size. Normally the size of the reservoir is calculated 11/2 times the pump gpm. Improper selection/performance of oil cooler: If you select a wrong oil cooler then it will be the reason for overheating. So, replace it with a new one having larger heat exchange capacity. In case of inadequate performance, check water temperature and perform a required action or clean the radiator of cooler. Malfunctioning of components: Replace or repair the worn or damaged components in case of malfunctioning. The working of the heater is an important component that will affect the temperature of the oil. So, check and replace the heater or thermostat. Low fluid Viscosity: Low fluid viscosity will cause problems related to leakage. So, replace the fluid with one having required viscosity. Aeration and cavitation are the common hydraulic pump problems. We can discuss other issues and their resolving techniques here. Not discharging hydraulic fluid: High viscosity of the fluid will be a reason for this issue. To avoid this issue, replace the fluid or heat it using the heater. Other reasons are increased suction height, worn or damaged components, slow rotation of pump, improper adjustment, etc. Noisy pump: Noise from the pump is due to the presence of air in the fluid. This is called aeration and cavitation. Aeration is the process that mixes air with the working fluid. Cavitation is the process of forming air bubbles(cavities) in the fluid. The reasons for aeration are a loose connection of suction pipe, damaged pump components and shaft seal, pressure beyond the specified limit. Cavitation is caused as a result of a narrow or long suction line, insufficient capacity of boost pump, high speed and clogged air breather. Knocking: Knocking is caused by the presence of air in the oil, packing resistance, bump at the load side, damaged inner tube, or improper valve operations. These problems can be eliminated by removing the air from fluid, replacing the packing or applying molybdenum disulfide coating to the piston, centering the actuator and making the load line smooth, repairing the tube, and inspecting and diagnosing the cause of failure respectively. Thrust Reduction: Air in working fluid, insufficient pressure and internal leakage are the reasons for thrust reduction. You want to inspect and diagnose the failure cause.